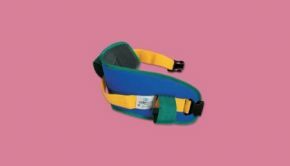 The Comfy Lids Paediatric Handling Transfer Belt. This bright and cheerful transfer belt for paediatrics can be used for walking, cycling, horse riding, floor work or any situation where extra stability and security are required. Fits waist sizes from 380 to 640mm (15 to 25").